As the proliferation and popularity of indoor range training continues to grow, so too have the known dangers inherent to airborne lead contamination. This Winchester 105 grain 9mm Super Clean Jacketed Soft Point ammo is a cost effective, lead free solution to indoor range training while mitigating your exposure to lead. 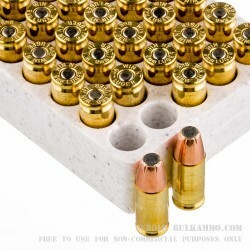 Forged from a solid zinc core, the 105 gr. jacketed soft point rounds are 100% lead free, and will not lead foul your barrel of expose you to airborne lead particles unlike more common range ammunition. The round nose flat point curvature of the bullets face also make for an inherently accurate, flat shooting round with an incredibly consistent point of aim, point of impact. Precision measured propellants are free of heavy metal contaminants such as mercury and aluminum, and at an average muzzle velocity of 1,200 feet per second, the Winchester 105gr 9mm Super Clean JSP is as hard hitting as it is clean and sustainable. 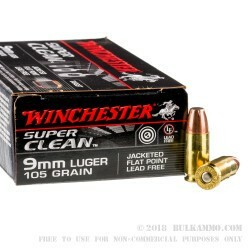 Health conscious shooters looking to mitigate further lead expose while training indoors will find no better solution than the Winchester 105gr 9mm Super Clean JSP.